Behold the sea itself: the thrilling call to arms which launches Vaughan Williams's A Sea Symphony rings out spectacularly in Hyperion's new recording from Martyn Brabbins, Elizabeth Llewellyn, Marcus Farnsworth and the BBC Symphony Orchestra and Chorus. 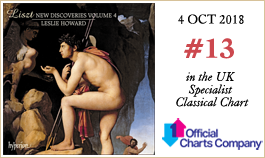 All rise magnificently to the challenges of this epic work; an outstanding Record of the Month for October. 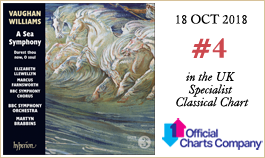 Vocal textures—and existential musings—of a very different stamp are to be had in Machaut The gentle physician, the sixth instalment in The Orlando Consort's ongoing survey. 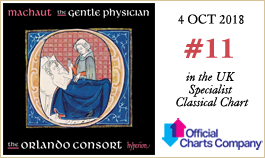 The fourteenth-century composer-poet can seldom have known such committed performances, the music brought into sharp relief across seven intervening centuries. 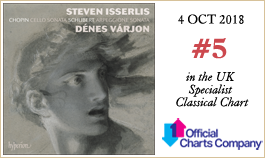 Any new recording from Steven Isserlis is an event and this apposite pairing of the Chopin Cello and Schubert Arpeggione Sonatas does not disappoint, the timbres of Dénes Várjon's mid-nineteenth-century Érard piano adding to the attractions of a highly desirable release. 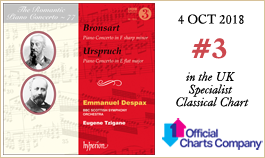 The Romantic Piano Concerto reaches volume 77 with Bronsart and Urspruch Piano Concertos, two splendid works from the series' nineteenth-century Austro-German heartlands featuring the brilliant young pianist Emmanuel Despax. Both he and Eugene Tzigane, who conducts the BBC Scottish Symphony Orchestra, make their Hyperion debuts. And how better to celebrate Leslie Howard's seventieth birthday year than with Liszt New Discoveries – 4? This is a fascinating supplement to Hyperion's comprehensive Liszt project—the hundredth CD, no less—and will be an essential purchase for anyone who has followed this remarkable musician's heroic exertions in the composer's service. A new release from LSO Live plunges us into New York's Greenwich Village of the 1930s. A salute to the city that made him big, Leonard Bernstein's Wonderful Town predates West Side Story by some four years and is packed with the composer's trademark heart-on-sleeve melodies. 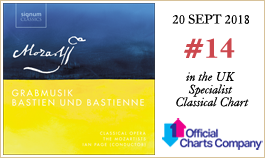 Sir Simon Rattle conducts a vivacious London Symphony Orchestra, with Danielle de Niese, Alysha Umphress and Nathan Gunn heading up the cast. 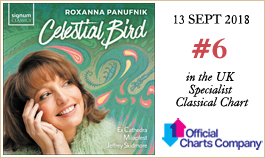 A ninth release in David Goode's highly respected Complete Bach Organ Works cycle for Signum Classics has at its heart the mammoth chorale partita Sei gegrüßet, Jesu gütig, BWV768, while Celestial bird & other choral works by Roxanna Panufnik is a rich assessment of the composer's first half century in the genre. Ex Cathedra and Jeffrey Skidmore revel in this diverse programme. The Mozartists and conductor Ian Page continue their pilgrimage on Signum with two little-known early works: Mozart's Grabmusik & Bastien und Bastienne. The former was apparently composed while the ten-year-old composer was locked up for a week 'as a test', while the slight but charming opera was Mozart’s first essay in the genre of comic German singspiel. Rather more 'mainstream', Rachmaninov's Symphony No 3 and Symphonic Dances complete Vladimir Ashkenazy's live cycle with the Philharmonia Orchestra. New on the King's College Cambridge label this month is a further showcase for this most iconic of organs: Messiaen's La Nativité du Seigneur—nine extraordinary meditations touching the very heart of the Catholic faith—in a performance by Richard Gowers. A generously priced new collection from LSO Live brings together all of Sir John Eliot Gardiner's award-winning cycle with the London Symphony Orchestra: the complete Mendelssohn Symphonies also includes three of the composer's most popular overtures as well as Gardiner's landmark version of A Midsummer Night's Dream. Recorded live at London's Royal Festival Hall by Signum, the Chineke! 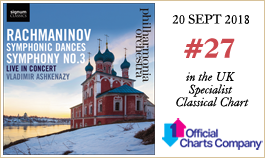 Orchestra's second album presents Rachmaninov Piano Concerto No 3 and Sibelius Symphony No 2. Roderick Cox conducts this most exceptional of groups and the soloist is the international prize-winner Gerard Aimontche.